Spring season in Alaska is upon us, time for BBQâ€™s with friends, playing games in the yard, and enjoying outdoor life in the land of the midnight sun. Unless of course you donâ€™t have your yard done yet, in which case Alaska Rewards has you covered. With todayâ€™s deal we offer you 1,500 sq/ft of topsoil delivered and prepared from the fine people at C & L Construction and Landscaping, then that topsoil will be hydroseeded from Alaska Green Hydroseeding for only $199, regularly $825! Thatâ€™s 76% off of retail. 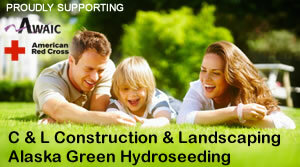 You will have a lawn in as little as 15 days with proper care, they guarantee it! Plus, if you require a larger area then 1,500 sq/ft they offer super low rates to complete the rest of your project. So quit procrastinating on getting the yard done, let the professionals do the dirty work, while you get to let everyone know how smart you are by getting a deal on your lawn. Â Plus you can feel great that a portion of each deal goes to benefit the American Red Cross & AWAIC. The American Red Cross of Alaska serves the entire state of Alaska, and you can count on us to be there to help you in times of need. AWAIC is dedicated to domestic violence safe shelter and intervention. Limit 1 per household and lawn, may purchase 2 as gifts. By appointment only. Not valid with any other offer. Anchorage bowl only. Is this good for the Mat-su too?? This is a fabulous deal! Unfortunately its not available in the Mat-su area. We do plan on offering a deal similar to this for the Mat-su area coming up. We are working on growing our numbers out in the valley before we launch out there. So tell your friends about us so we can launch our services out there. Thank you so much for your support and we look forward to serving the valley soon. what do we need to do to get yard prepared for this…do you give estimates for the remaining portion of yard that we may need to have done…we are in Chugiak, just North of Eagle River,will that work? Let me know when you are going to service the Mat-Su area. I am all the way up at 96.1 at Montana Creek. I will try to get you some business around this area. How many homes do you need to make it worth your while? The “Refer Friends” button does nothing. Anyone know how that works? Can this be done over an existing lawn that is in need of leveling out and reseeding? I’ll be looking forward to seeing to seeing this in Palmer We just had our house built and I NEED grass!! !